MATAN FELDMAN is founder and CEO of Wall Street Prep, a provider of step-by-step self-study courses and customized university and corporate training seminars in financial accounting, corporate finance, financial modeling, valuation modeling, and M&A modeling. Before Wall Street Prep, he worked as an equity research associate at JPMorgan Chase & Co. and as a financial analyst in the M&A group at Chase Manhattan Bank. He received an MA in economics with honors from Boston University. ARKADY LIBMAN is the Managing Director of Wall Street Prep. Before Wall Street Prep, he worked as an equity research associate at Friedman, Billings, Ramsey & Co., Inc., and as an investment banking analyst at JPMorgan Chase & Co. He completed coursework at the London School of Economics and graduated with honors from Bowdoin College with a BA in economics. Why Is the 10-K Important? Accrual versus Cash Accounting: What’s the Difference? Depreciation Is a “Phantom” Noncash Expense. Amortization Is a “Noncash” Expense (Like Depreciation). EBITDA: Popular Measure of a Company's Financial Performance. Assets Represent the Company’s Resources. Liabilities and Shareholders’ Equity Represent the Company’s Sources of Funds (i.e., How It Pays for Assets). Why Is Double-Entry Accounting Important? Short-Term Debt versus Long-Term Debt. Solid foundation: This book is written by investment bankers and follows a clear, easy-to-follow style. It provides practical applications and real-world examples as well as exercises. 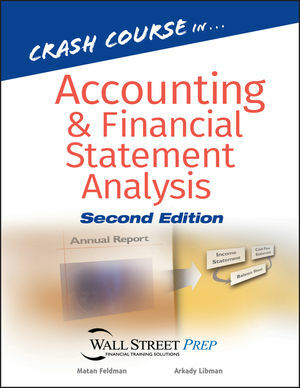 New to this edition: More examples have been added, IFRS/GAAP discussion has been expanded, Income Statement and Balance Sheet as well as Cash Flow Statements exercises will have been increased.